U.N. Secretary General Antonio Guterres addresses the 73rd session of the United Nations General Assembly, at U.N. headquarters, Sept. 25, 2018. 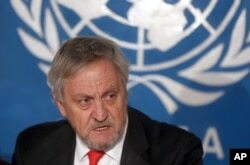 The United Nations secretary-general said Friday that he "deeply regrets" the decision of Somalia's federal government to expel a top U.N. official, Nicholas Haysom, from the country, but that he will name a replacement. Then the top UN envoy in Afghanistan, Nicholas Haysom speaks during a press conference in Kabul, Feb. 18, 2015. "The secretary-general has full confidence in Mr. Haysom, an experienced and respected international civil servant who has distinguished himself in numerous senior leadership roles, in the field and at U.N. headquarters," Antonio Guterres' spokesman said Friday. "At the same time the secretary-general is totally committed to ensuring that the needs of the Somali people are at the forefront of the work of the United Nations in Somalia." The Somali federal government declared U.N. envoy Haysom "persona non-grata" on Jan. 1, ordering him to leave the country just four months after he took up his post as the U.N. secretary-general's special representative and head of the U.N. assistance mission in the country. 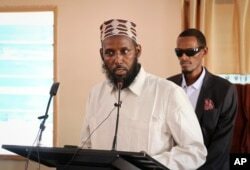 The government was upset over a letter to the authorities from Haysom raising the case of Mukhtar Robow, a former al-Shabab leader who has moved into politics and sought to participate in elections in the South West state. In this Oct. 10, 2018 photo, Mukhtar Robow, who was once deputy leader of Africa's deadliest Islamic extremist group the al-Shabab, speaks at a press conference about his candidacy for a regional presidency, in Baidoa, Somalia. ​The national electoral commission banned Robow from running, while the South West state electoral body said he could be a candidate. Robow was arrested last month and violent protests ensued both for and against the decision. Guterres' spokesman said the U.N. chief spoke twice this week with Somali President Mohamed Abdullahi "Farmajo" Mohamed. Efforts to smooth over the disagreement apparently failed. In a letter from Guterres' office to the government of Somalia seen by VOA, the U.N. argues that the doctrine of "persona non grata" does not apply to U.N. personnel, but to "diplomatic agents who are accredited by one state to another in the context of their bilateral relations." It goes on to say that it is the secretary-general's prerogative to appoint staff and decide where they serve, for how long and when they are to be recalled. Until a replacement is named for Haysom, deputy special envoy Raisedon Zenenga will head U.N. activities in Somalia. At a meeting of the U.N. Security Council on Thursday, Somalia's ambassador, Abukar Dahir Osman, said the U.N. has a duty not to interfere in his country's internal affairs. Of the Robow case, he argued that a former member of al-Shabab or any terrorist group must undergo "stringent" rehabilitation before being allowed to assume leadership positions.